Special Silicone Baking Properties will make you love them instantly! -Save your money and help the environment! -These high-quality,easy-release and non-stick baking cups are reusable. -No need to buy paper cups ever again,you can reuse our baking cups over and over. -Perfect for dinner parties,just peel the side to pop out your muffin,cupcake,dessert....! Use multi-use liners to rich your kitchen life. Colorful and fun will be full of your whole family. Use your imagination and knock up other tasty little treats like: Ice cream cakes! 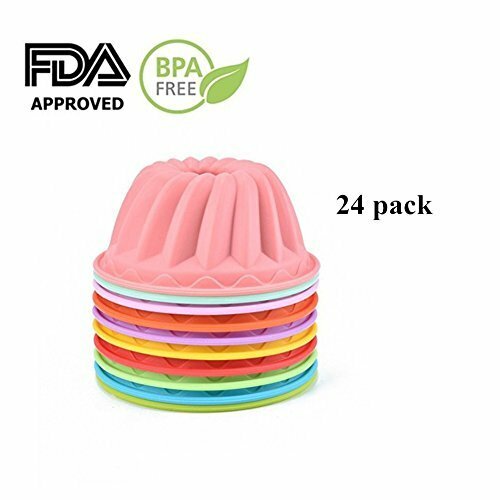 【Makes Lunch Irresistible】- SHareling Silicone Cupcake Liners make eating fun by separating veggies, snacks and fruits in a kid's bento lunchbox. Pack a nutritious meal and avoid the processed food rut. Picky eaters love eating healthy meals using these bright, vibrant, rainbow colors! Check out our assorted size and shape options. 【Browned Wonderfully and No Chemical Smeli】- Emanating from the oven or tastes in the muffins. You will love these jumbo cups so much! Some residue is left behind which would totally expect, but cleaning is a breeze. It's worth it not having to waste money on paper tin liners and ultimately saves trees. Penny pinchers and those environmentally conscious, this product is definitely for you! 【Multipurpose Versatility】- Great for cooking eggs, baking muffins, cupcakes, and breads, preparing frozen treats, desserts on a baking sheet, candy making. Perfect holder for sorting small items. Fun for a birthday or holiday party, baby shower, or wedding! Use to prepare recipes for breakfast, lunch, dinner, snack or mealtime spread. Replace your paper cake cups, muffin pan or tin, with our environmentally safe alternative. Imagine this space saver in your kitchen baking supplies pantry! 【Shareling Satisfaction Guarantee】- If for any reason you are not satisfied with this product, return it for replacement or refund,Without no exced. If you have any questions about this product by SHareling, contact us by completing and submitting the form below. If you are looking for a specif part number, please include it with your message.